Unique model railroad structure Plan-Sets designed in CAD. 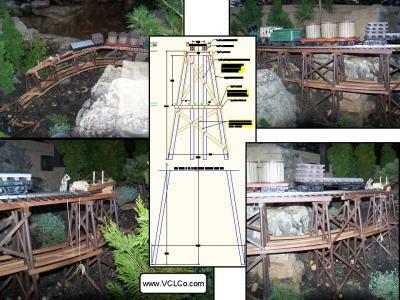 Plan-Sets offered to construct Trestles and Viaducts. Viaducts have been loosely defined as multispan bridges. Single Track Timber Trestles​​ •••• This Plan-Set is for typical freelance timber bents found in deep canyons and ravines in the early days of railroading. 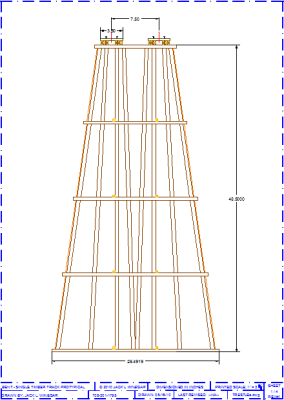 Drawn is a four story 48-½ʺ tall bent (can easily be adjusted in 12ʺ story increments) with a 26½ʺ base. Bents are recommended spaced at 7ʺ to 8ʺ apart. $15 1:24 (½ʺ) scale Single Track Plan-Set includes: 8) 13" x 19" super B drawings with the 48½ʺ tall bents shown in full size to use as a template with all details dimensioned thereby not requiring scaling of drawings. Single Track Timber Trestles​​ •••• This Plan-Set is for typical freelance timber bents found in deep canyons and ravines in the early days of railroading. 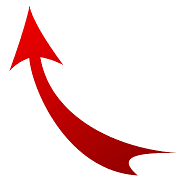 Drawn is a four story 48-½ʺ tall bent (can easily be adjusted in 12ʺ story increments) with a 19ʺ base. Bents are recommended spaced at 7ʺ to 8ʺ apart. $14 1:24 (½ʺ) scale Single Track Plan-Set includes: 7) 13" x 19" super B drawings with the 48½ʺ tall bents shown in full size to use as a template with all details dimensioned thereby not requiring scaling of drawings. 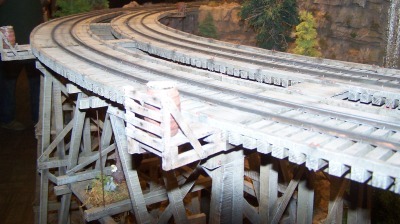 Single Track Wood Pile Trestle​​ •••• This Pile Plan-Set (being round poles as compared to rectangular timbers) trestles were the preferred choice of railroads if soil conditions allowed for the driving of piles. 16ʺ tall bents have an 8½ʺ base, 31⅜ʺ tall bents have an 13⅛ʺ base. 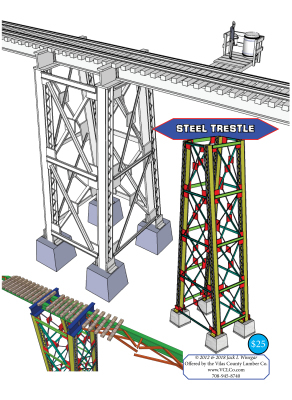 Single Track Steel Viaduct​​ •••• This unique spindly Steel Trestle design Plan-Set includes options to build towers for any railroad era based on prototypical practices. Readily available commercial members are recommended for constructions that only have to be cut to length with no difficult cuts and easily bonded together. The tower shown is 30ʺ tall and can easily be modified in 7½ʺ story increments. The Material List, lists the number of items and their lengths needed to make this unique spindly Steel Trestle. Members are printed in color for easy identification and assembly. Options also include different sizes of detail members for prototypically shorter and taller towers. Other options included variations from riveted construction with turnbuckles and truss rod diagonals from earlier turn of the last century steel trestles to modern welded constructed trestles. 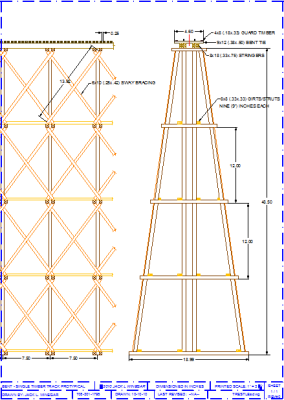 $14 Single Track Plan-Set includes: 7) 13" x 19" super B drawings drawn for 30ʺ tall towers, full scale construction, cutting and optional rivet drilling templates with scaling and weathering sheets. And, 3-D construction renderings. 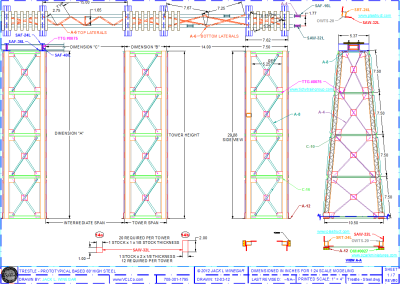 $21 Double Track Plan-Set includes 15) 13" x 19" super B size drawings drawn for 30ʺ tall towers, full scale construction, cutting and optional rivet drilling templates with scaling and weathering sheets. And, 3-D construction renderings. Safety Island Platform​​ •••• Every railroad with trestles (steel or wood) needs Safety Island Platforms for the safety of its employees who got caught on a trestle as a train approached. A bucket of sand with a barrel of water would be included to extinguish fires on wood trestles started by the hot coals from a steam engine. Safety Island Platforms would be located from 50΄ to 150΄ along trestles depending on the railroad’s standard. Patented Boom​​ •••• The “prototype” for this machine was a poor reproduction of a patent drawing. Was it ever built? The only one I know of is the one I built for the Taltree Arboretum & Gardens. The patent drawing is included in a drawing. This boom is part of a Building The RR Vignette showing the American RR going west. $8 Plan-Set includes: 2) 13" x 19" super B drawings. Instead of spanning a valley, road, stream, or another railroad track, only with trestles, incorporate a timber truss bridge in the center of the span or at one or both ends. The Great Kinzua Viaduct​​ •••• This viaduct spans the Kinzua Creek in Pennsylvania. The bridge was 301 feet tall. Most of its structure collapsed during a tornado in 2003. This is a HO scale replica of the Kinzua Viaduct. As shown in the Plan-Set this viaduct would be 23¼ feet long. But a fine scale model can be built within the space you have available by reducing the number of bents. $26 Plan-Set , includes: 26) 13" x 19" super B drawings. Plan-Set includes a material list with full size templates of truss pieces using commercial styrene shapes with 3-D renderings.